In order to achieve sustainable society, it is necessary to transform industrial structure to the one that does not reduce the Earth's resources. Under this circumstance, a business model of "not selling goods, but selling services" has been expected as a measure of co-existence of business and the environment. 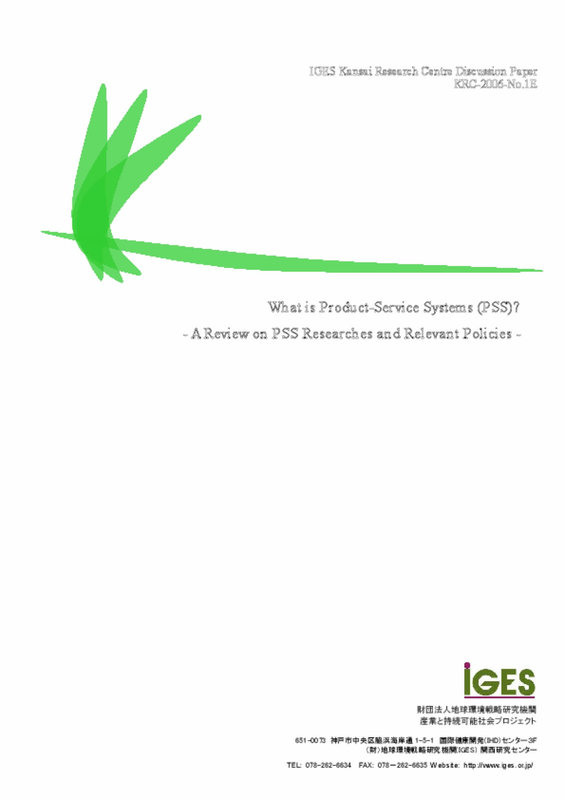 This idea, which is called as "Product-Service Systems: PSS" or "Servicizing" etc., has been studied in Europe, the United States and international organisations, and is now studied in Japan. However, the idea of PSS is still not effectively used for policy development.One of the major reasons is that PSS concept itself is under-developed. Under the unclear concept of PSS, researchers are working towards more scientific understanding while policy makers are trying to develop new policy measures, and there is confusion in those communities. In order to develop policy measures, it is necessary to make clear the position of PSS in socio-economic system. This paper overviews previous PSS researches and relevant policy measures conducted in Japan, the US and EU, and tries to grasp the context of researches and policy activities and to find out the agenda of the current status. The characteristics of PSS rest on the innovative relationship between producer and consumer. However, PSS researches are stuck at measurement of environmental loads, and relevant policies tend to be rest on the ones targeting producers. In order to get out of this situation, it is necessary to ask question what is PSS and to make it clear where PSS can be positioned in socio-economic system. PSS is important, because PSS has an element of creating sufficiency as well as eco-efficiency. It is recommended that PSS concept needs to be examined as a research effort, and environmentally sound product policy needs to be systematically organised.